How much money can I expect from my Iowa Workers' Comp claim? How much money can I expect from Iowa Workers' Compensation claim benefits? whether you need vocational rehabilitation. While this can serve as a guide, the only true way to find out what you are owed is to contact an Iowa Workers' Compensation attorney. A workers' comp attorney who is highly skilled in these types of cases will guide you through the process. To maximize the value of your claim, it's important that you promptly report your injury to your employer and speak with an Iowa Workers' Compensation attorney as quickly as possible. Since Workers' Compensation insurance companies have so much to lose and nothing to gain when an injury takes place, it becomes that much more important to contact a skilled Workers' Compensation attorney. At Walker, Billingsley & Bair, we have the knowledge, experience, and skill necessary to make sure that you get what you legally deserve. 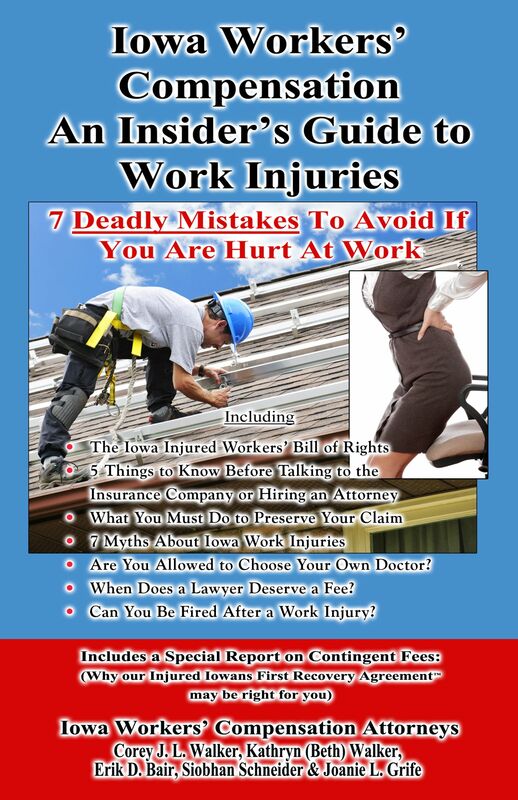 Call us today at (888) 435-9886, and ask about our guide: Iowa Workers’ Compensation – An Insider’s Guide to Work Injuries: 7 Deadly Mistakes To Avoid If You Are Hurt At Work.